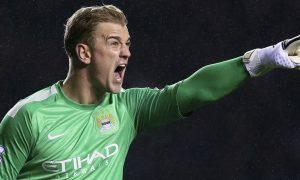 Manchester City are ready to allow Joe Hart to make the controversial switch across town to Manchester United – provided Jose Mourinho wants the England goalkeeper. David De Gea is heavily rumoured to be joining Real Madrid this summer and according to both Simon Mullock of the Sunday Mirror and Ken Lawrence of The Sun on Sunday, City will not stand in Hart’s way. Transfers between the Manchester clubs are incredibly rare, but Pep Guardiola has told Hart that he doesn’t want him back, and if United were to go for him and cough up £30 million, City would allow the deal to go through – one that fans of both Manchester clubs might have mixed feelings about. The Sunday Mirror claims that Mourinho has 30-year-old Hart on a list of potential summer recruits, depending of course on whether De Gea does finally move to the Santiago Bernabéu. Another goalkeeper, Tony Coton, was the last player to move from City to United, in 1996. Carlos Tevez went from United to City, but was purchased by City from third-party owners, not United, in a complex deal. What do you think, Blues? Should Pep allow Hart to move to Old Trafford? Limited Time Only – Buy Online Now!